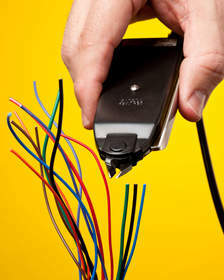 SACO, ME--(Marketwire - March 4, 2011) - Xuron Corp. has announced an air-powered wire cutter that is designed to fit comfortably in large and small hands and has a soft touch actuator for effortless high volume flush cutting in assembly and production environments. The Xuron® Model 590 Micro-Pneumatic™ Cutter has a tapered rectangular shape that is comfortable to hold in right and left hands, regardless of size, and has a side bar requiring only 1/16" of travel to actuate the blades. Suitable for high-volume wire cutting applications, this ergonomic hand tool eliminates manual squeezing, is torque-free, and quiet operating. Featuring cutter blades with bypass edges that produce clean, flush cuts, the Xuron® Model 590 Micro-Pneumatic™ Cutter is offered with standard blades, blades with lead retainers, and low-profile blades for reaching into tight spaces. Requiring only 50 psi air and 0.13 cfm, it incorporates an internal bellows and generates less than 60 dbA of noise. The Xuron® Model 590 Micro-Pneumatic™ Cutter is priced from $180.00 (list). A catalog and price list are available upon request. Xuron Corp. is one of the world's leading manufacturers of ergonomic electronics-grade hand tools for the electronics, aerospace, plastic molding, hobbies, craft, floral and fishing industries. The company holds numerous domestic and international patents, including an inventor's patent for the original Micro-Shear® flush cutter and its unique cutting action which creates smooth, clean cuts without compression. Xuron tools are manufactured in Saco, Maine, where quality, an outstanding work ethic, and flawless craftsmanship are a long-time tradition. They are available at hundreds of distributors worldwide who offer more than 100 different types of Xuron quality-crafted hand tools and associated products. About this company Xuron Corp. The Xuron Model 590 Pneumatic Wire Cutter has a tapered rectangular shape that is comfortable to hold in right and left hands, regardless of size, and has a side bar to actuate the blades. This ergonomic hand tool eliminates manual squeezing, is torque-free, quiet, and ideal for high volume assembly and production applications.